I’ve enjoyed previous visits to Duende, so when I heard the crew behind Duende had launched a new venue in West Perth I was keen to visit. 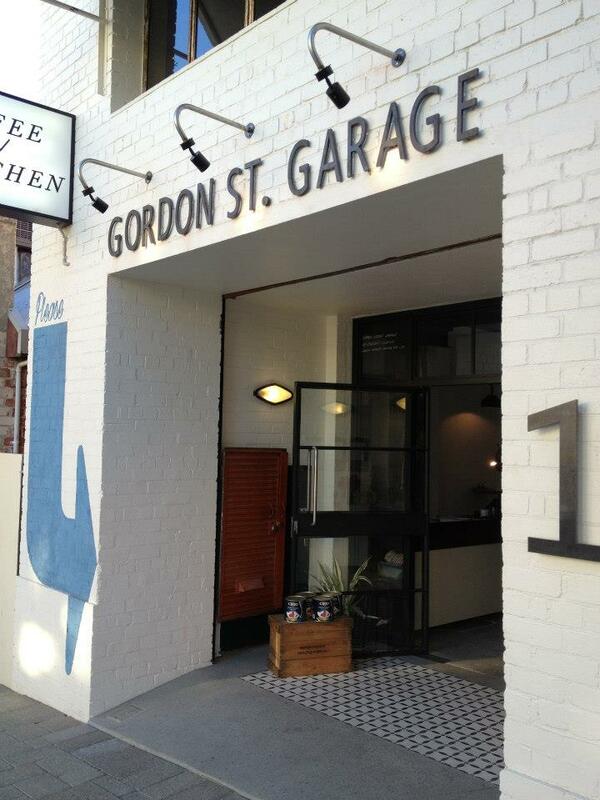 There seemed to be quite a buzz about the place and I’ll admit that when I saw a few pics of Gordon St Garage pop up on Instagram and Twitter I was all the more intrigued. 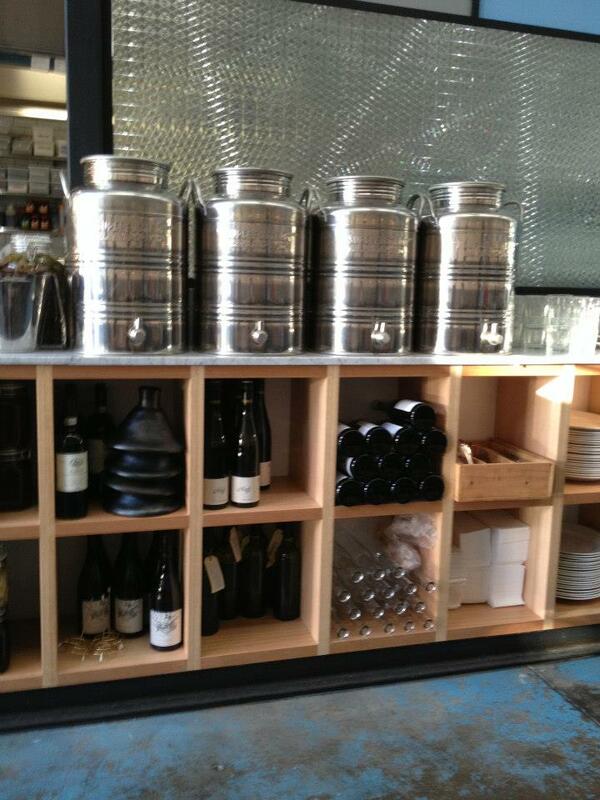 So when a friend and I were due for a catch up it was not a hard decision to lock in GSG as our venue of choice. Thankfully arriving at 7am on a weekday when the doors first swung open meant that securing a table was no issue. The first thing that struck me was the size of the venue. It’s definitely on the bigger size, which is a good thing given they don’t take bookings except for dinner on Fridays and Saturdays, so the multitude of tables means that hopefully it isn’t too difficult or the wait too long for a table. We were greeted at the front counter by a friendly staff member and shown to one of the booth style seats opposite the kitchen, which gave us a chance to check out the chefs in action. They really have done a great job with the fit out. It’s a big open space and with its concrete floors and exposed steel beams along the roof it does still have somewhat of a garage feel to it. 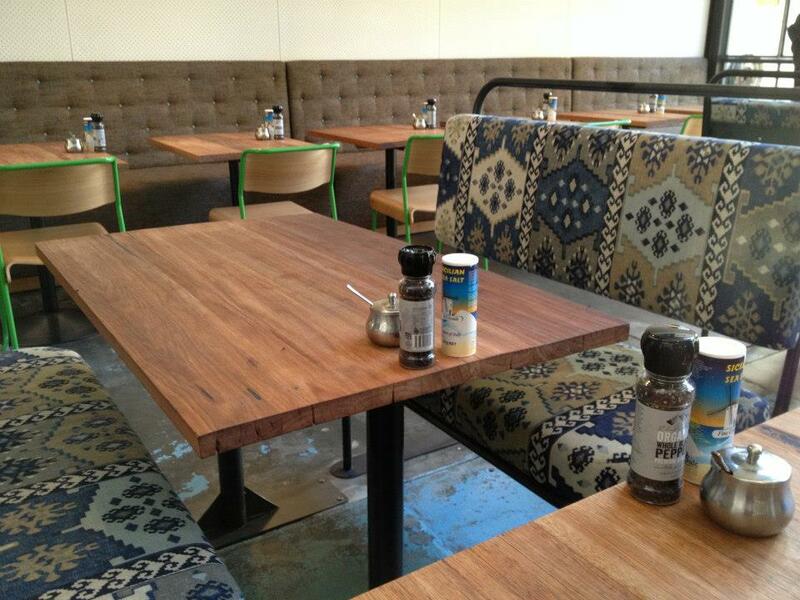 There’s a different mix of seating – the booths we were in – with their beautiful printed fabric seats, some tall tables and stools and more regular table and chair arrangements. And reminiscent of Little Creatures in Freo you can also sit upstairs in a raised area along the back corner of the restaurant. Coffee was definitely the first order of business and I ordered a soy latte and my friend, Miss E, a cappuccino. While they were being made we turned our attention to the menu. Some interesting options available. You can go for your standard eggs on toast and then tailor it to your liking with the range of different sides they have on offer. 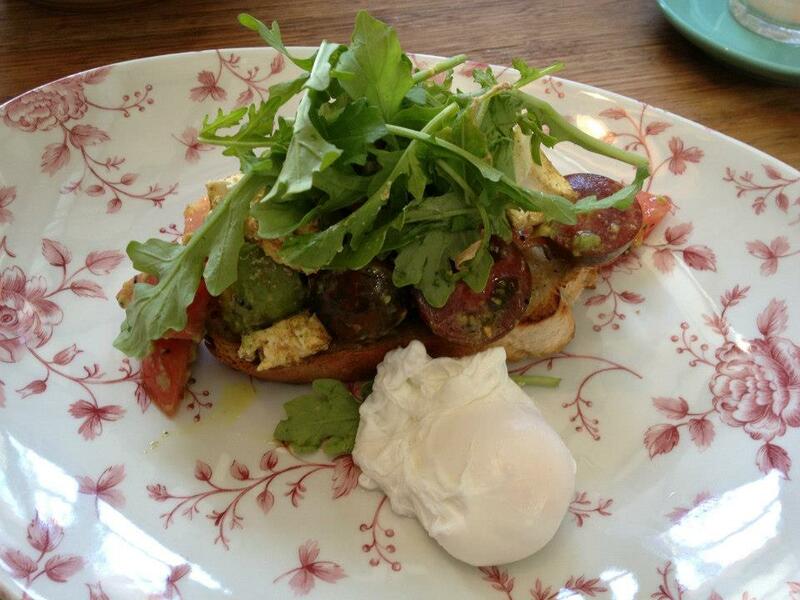 I decided to give the Bruschetta, avocado, heirloom tomato, labneh, poached egg ($19) a go. 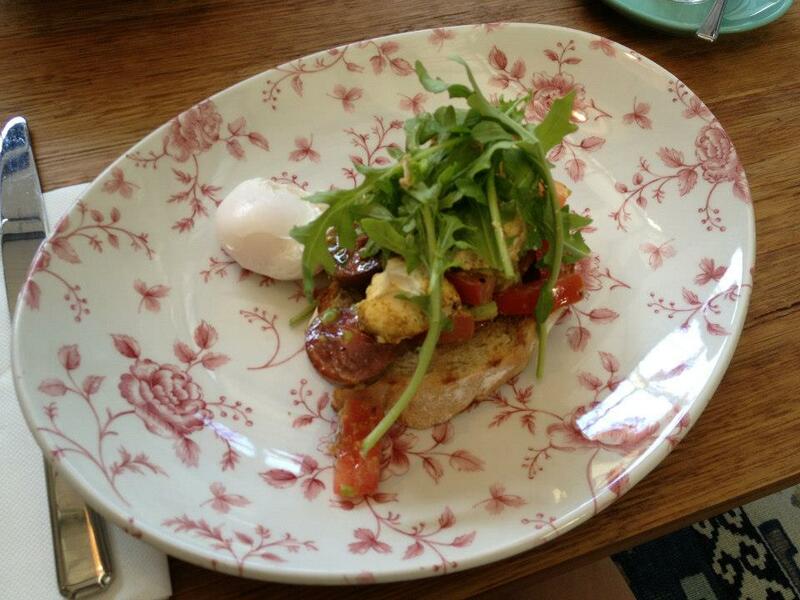 I think in my mind (with the exception of the avocado) it reminded me of my favourite breakfast dish at Jacs. 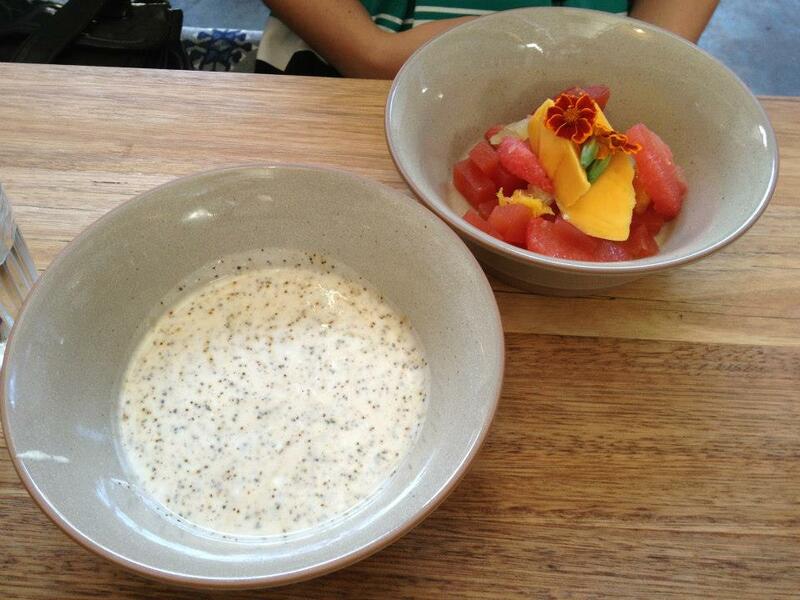 Across the table Miss E ordered the Mango, watermelon jelly, citrus salad, wattle seed yoghurt ($14). Not entirely sure that she would be a massive fan of wattle seed yoghurt, she asked for her yoghurt to be served on the side, which was no issue. 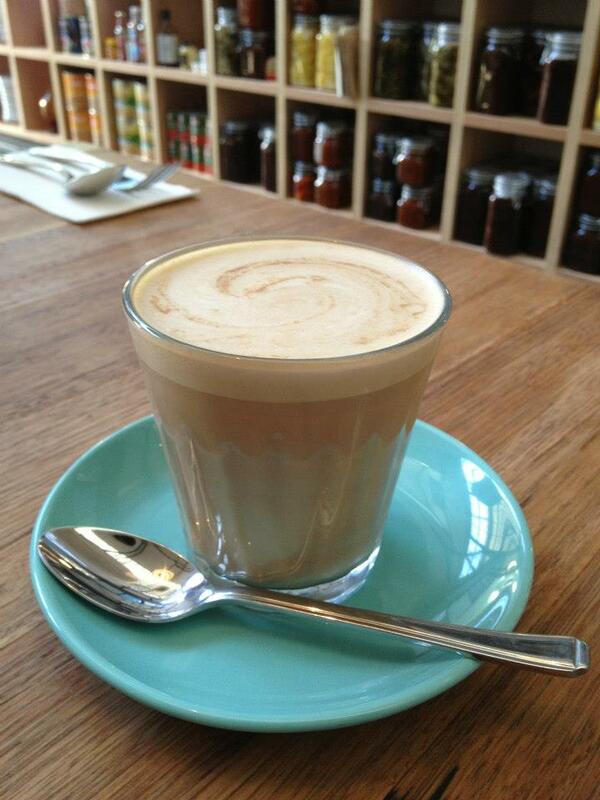 So we placed our orders and shortly after our coffees arrived to give us a highly anticipated morning caffeine kick. I really loved the colour of the cups and saucers they used – aquamarine? Teal? I wasn’t entirely sure, but I liked the shade nonetheless. And the coffees both presented very well. I was a bit disappointed at the temperature of mine though. I by no means like my coffee to be red hot and will often wait until it’s a more drinkable temperature, but this arrived and was probably a touch below the drinking temp already. Yes I probably could have sent it back and asked for it to be hotter, but I couldn’t really be bothered, so I just drank it quickly. The place was filling up at this point, so I was grateful we had our food orders in. 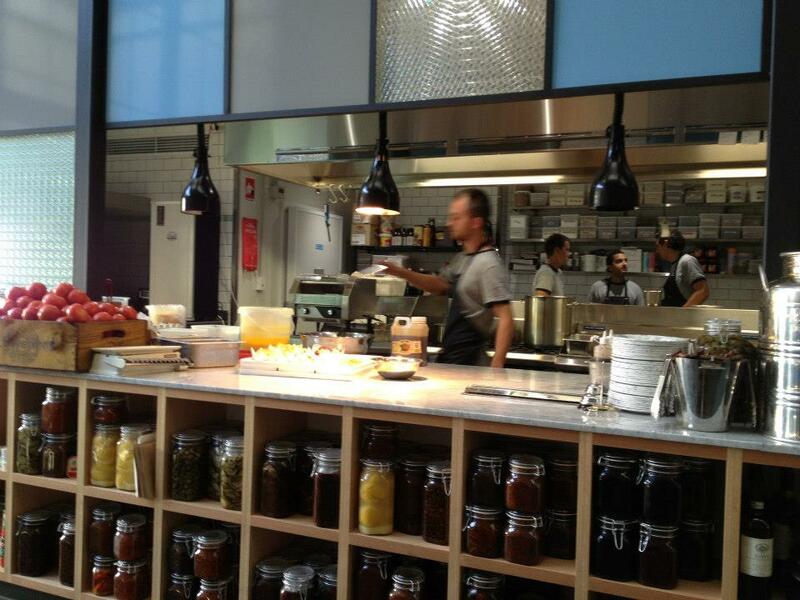 You could see the flurry of activity in the kitchen as the team of chefs worked hard to prepare all the meals. 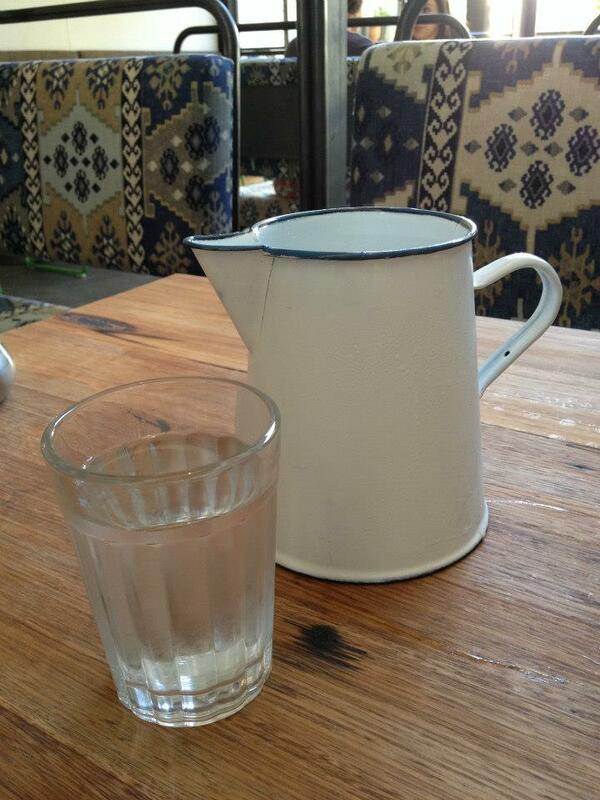 Ours were soon delivered to the table and again I was struck by the beautiful crockery, such a pretty floral print! My breakfast looked nice. An interesting mix of tomatoes had been used for the bruschetta, predominantly heirloom tomatoes as per the menu description, which present well with their green tinge. 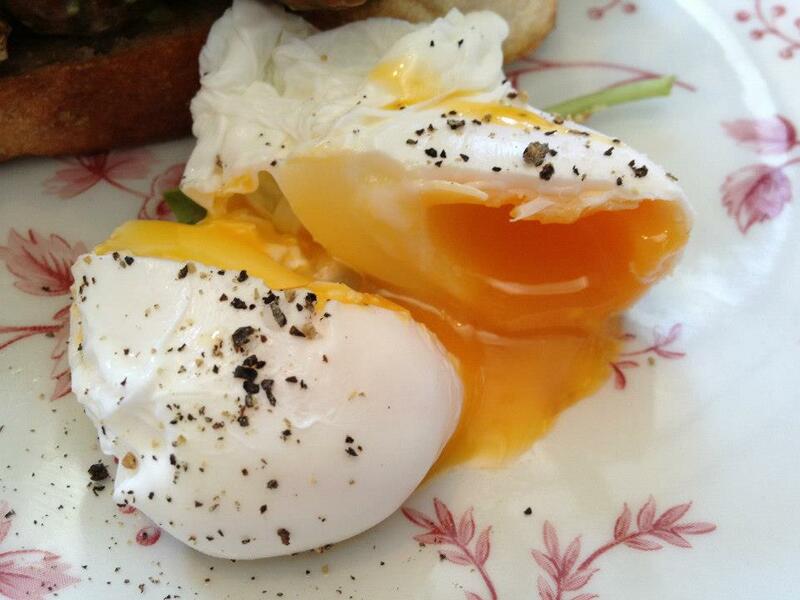 As is important when ordering a dish with a poached egg, it’s all about that first cut. So I sliced into my egg and smiled at the indulgent pool of golden yolk that formed. Not a bad egg right there. The labneh added a nice creaminess to the dish. But I just wasn’t that sold on the taste of the tomatoes. I had hoped there would be more sweetness to them and granted I have not eaten that many heirloom tomatoes and it may not be part of their design, I think I had wished that they were sweeter. I ended up sprinkling on some salt and pepper, not that it was going to do anything on the sweet side, but it helps with seasoning and I think is a must for eggs and for avocado too actually. Overall I was a little disappointed with this dish. Found it to be a little on the bland side. 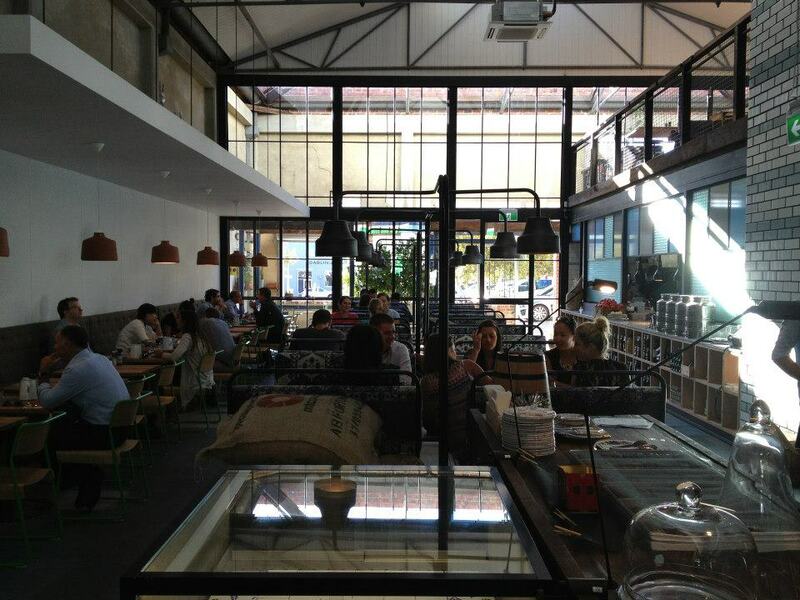 It’s a trendy new venue and staff had been friendly and were easily accessible, floating around to tables frequently. While I hadn’t been completely won over with this meal I am keen to head back and check out their lunch or dinner options and see how they fare. Will drive myself to the garage again soon I’m sure. Awesome review! I havent heard of this place but looking forward to checking it out!! Good review! I’ve only been there for coffee and a snack of a shared pizza, but am looking forward to have a proper meal there soon.